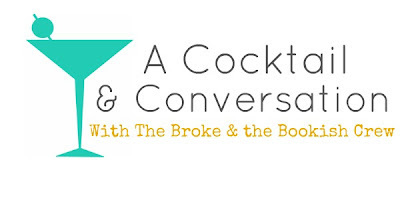 It's time for another Cocktail and Conversation with the Broke and Bookish ladies! What are you most looking forward to as we head into fall? Bridget says: I am sooo looking forward to opening the windows, lighting candles (Yankee Candle Kitchen Spice or bust), wearing boots and sweaters and jeggings, offices being a reasonable temperature instead of feeling like a refrigerator, the leaves changing, finally having an excuse to wear tights with my dresses, less humidity aka less frizziness...I could go on!! Jana says: I love the cool, crisp weather that makes sweaters so cozy! Pumpkin bread from my favorite local bakery. Drives up the canyon to see the leaves change colors. I love the atmosphere of the excitement surrounding Halloween and the spooky novels I read around that time. And I loooove Thanksgiving! Lori says: I can't narrow it down! I've started missing my boots and scarves. I will always be a summer girl, but I do love those clothes. College football, for sure. I love waking up on a Saturday and knowing my entire day is already full of the games. It doesn't even matter who is playing--it's just fun to watch. Lastly, the endless supply of chili that goes with the endless supply of college football. I have an awesome recipe. What are you looking forward to with fall? I read two of Moran's books over the summer--she is a delight! Now I own all three. I haven't started Moranifesto yet, but will probably do so soon. Legendary Authors is a lovely volume. It briefly profiles authors who are known for their clothing. I'm still reading it, but yes, I have read the Joan Didion entry. :) Girl, Interrupted was difficult to put down. It's the only one in my haul that I have finished. Heat and Cork Dork just looked like a lot of fun. I haven't had a ton of time to cook lately, but I think these might help me vicariously live in the kitchen. First They Killed My Father I picked up after reading the (somewhat controversial) Angelina Jolie interview in the September issue of Vanity Fair. I cannot quite remember why I bought Room, but it sounds really interesting. I purchased the Dostoevsky after watching the Mark Wahlberg film with the same name. I just knew it was based on some novella and once I figured out whose, I pounced. I bought the Conrad because he keeps coming up in all of the Joan Didion stuff I've been reading. Except! This volume doesn't have the novella Victory, which I most wanted to read. Whatever. The three Didions--I might have a bit of an obsession. She's just so wonderful and raw. Another Brooklyn has just been popping up on my radar a lot, so I bought a copy, easy peasy. There you have it--my recent acquisitions. 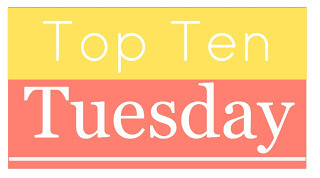 Today I, Jana, am tackling this topic on my own and decided to highlight some graphic novels I've read and enjoyed recently. I'm a baby when it comes to this entire world of graphic novels, so recommend some of your favorites if you'd like! 1. The Tea Dragon Society by Katie O'Neil: SO cute, very pretty illustrations, and lots of adorable tea dragons! 2. The Little Red Wolf by Amelie Flechais: A topsy turvy retelling of Little Red Riding Hood. Kind of dark, but beautiful. 3. Nimona by Noelle Stevenson: Fantasy with an awesome heroine! And villains! 4. The Arrival by Shaun Tan: A very sweet, wordless immigration story. 5. Rapunzel's Revenge by Shannon Hale: A wild, wild west Rapunzel! 6. Spill Zone by Scott Westerfield: A sci-fi graphic novel that Marissa Meyer blurbed! 7. Cast No Shadow by Nick Tapalansky: Guy is in love with a ghost. HELLO. 8. Saved By The Bell #1 by Joelle Sellner: It's SBTB! 9. Wires and Nerve by Marissa Meyer: It's The Lunar Chronicles! I loved seeing my old friends. 10. In Real Life by by Cory Doctorow and Jen Wang: It's about gamers!